After graduating from Western State College of Colorado, I worked for several years as a ski photographer. Spending every day in the snowy mountains for five months at a time, you either develop a love for snow or you move south. The body of work I gathered quickly turned into a third collaboration with my mother (notice the water theme runs throughout the series). My favorite spread is Mountain Painter; I can still feel the crisp cool air when I look at that page. Available in Boyds Mills hardcover and paperback. 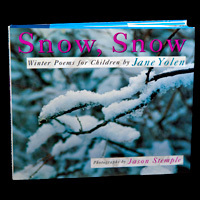 See Jane Yolen's description of this book as well as an assortment of reviews.